I was lucky enough to meet the owner, Claire, at Professional Beauty and be able to see first hand her passion for the brand + I was able to try the products and I was instantly impressed. Ermana’s whole focus is to place as much focus as we put onto our skin as what we put into our bodies, so all the products are natural, cruelty-free and designed to treat the skin. I’ve been using the Revive facial oil in the morning right after washing my face (my love for facial oils has been well documented), and the lovely blend of frankincense and lavender is gorgeously nourishing on the skin. My skin is always dry and a bit dehydrated and my skin just responds really well to oils, so using 2 drops of this in the morning ensures my skin is hydrated all day. I’ve also been trying out another skincare favourite, the Cleanse balm as my second cleanse in the evening – it smells incredible. I find cleansers without a smell so joyless in a sense, so this one is real treat + the cocoa, shea and coconut oils leave my skin feeling so soft and smooth. I am in love with this quirky little brand – I saw them at a beauty awards show and was so impressed with how their products managed to stand out to me. A Scottish brand focused on creating 100% natural skincare and with an extensive range of products, this brand is definitely going to get bigger and bigger. I’ve been trying their Seahorse Plankton range (which supports the seahorse trust), which has a focus on adding radiance to the skin with naturally active ingredients. My favourites are the high definition facial oil (really greasy in the best way) and the 5 minute miracle mask for calming the skin and leaving everything softer and smoother. 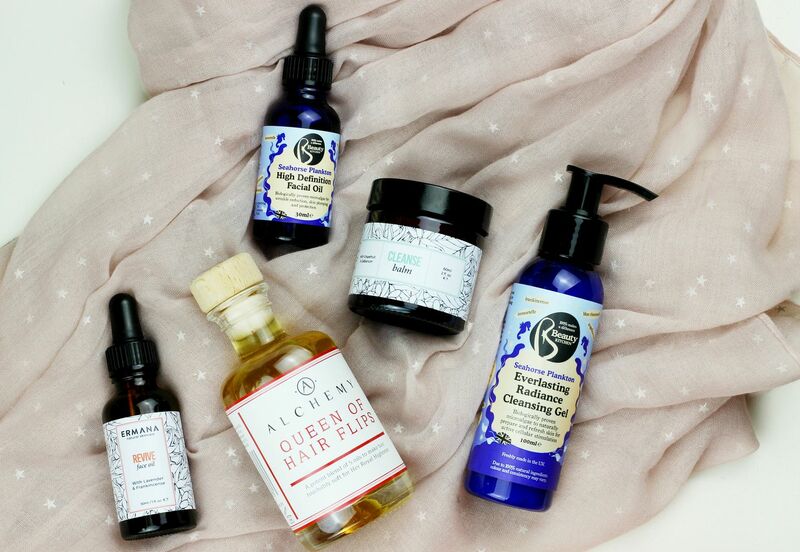 Whilst not specifically a skincare brand, Alchemy oils makes some of the nicest hair oils around – my hair is so dry and frizzy that a hair oil is pretty much an essential for me every time I wash my hair. With perhaps the best name ever, the Queen of hair flips oil has five oils (amla, coconut, avocado, argan + lemon essential oil), so it’s rich and nourishing but doesn’t weigh hair down so I’m that little bit closer to swishy locks.